Brought to you by the letter I and the WOOF Support Blog Hop. I is for Isis, the most beautiful name of the most beautiful dog in the world. What Do I Love About My Reactive Dog? Q. List your priorities. What would make life with your dog easier? What can you tolerate? What can’t you tolerate? A. Life would be easier if I didn’t have to worry so much when taking her out in public. I would like to walk her without her lunging and barking at bicycles. I certainly want to prevent her from biting people. I would like to take her to the dog park. I would like to have visitors over without her barking at them when they arrive. After pages of describing Isis’s flaws, I smiled at the final question. Q. Last but not least, what is wonderful about your dog? I loved that question! I imagined other dog owners going through this application process, fed up, ready to rehome their dog, thinking they had the worst dog in the world. Here our trainer was reminding those people to stop and remember why they had a dog in the first place. Not that I needed that reminder. A. Pretty much everything. I asked Rob, and he said, “Her smile.” It’s true, she is a very happy, friendly dog. Very smart, affectionate, and sweet. I love playing with her and walking her (when she’s not barking and lunging at things, or pulling on the leash). I love when she rests her head in my lap. I love watching her chew on her toys and race around the backyard and chase soccer balls. Before she started getting into trouble at the dog park, I loved watching her play with other dogs. Isis has been gone three years now, but what I loved about her … what I still love about her? So easy. Do you have a reactive or fearful dog? Please join us and share your story. 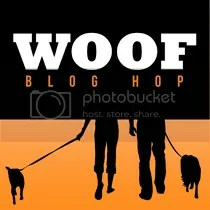 The Blog Hop is open through Sunday, April 13, hosted by Oz the Terrier, Roxy The Traveling Dog and Wag ‘n Woof Pets. Aww, she was a very pretty dog. I love your answer to what do you love about your dog. Ours are a lot of work, and have some issues, but I wouldn’t trade them for anything. Great post, Kari! How interesting that you were previously asked the question “What I Love About My reactive Dog”. Everything – and isn’t it the truth. Oz can make me crazy on walks sometimes but when I look into his eyes, I just can’t be mad at him. He makes me fall in love with him everyday! Thanks for joining the hop. Awwww, I love that. And that is so important to remember when we are exasperated with our reactive dogs. That was a great post! So many people give up on our reactive or fearful dogs and so quickly forget what they loved about them. What a great picture! I don’t know how you are all doing this a-z challenge, I’m fairly certain I would not be good at it, lol. Have a great week/weekend! Thanks. It’s been surprisingly rewarding. I’m finding a lot of blogs outside the dog blogging community, and I’m surprised how much I have to say once I come up with a topic. I don’t know how long I could keep up the blog-a-day pace, though. What a beautiful picture! We love our reactive girl too. Yes, there are things we’d like to change and would make our lives easier, but she is MOSTLY a very very very good girl! What a wonderful tribute to a beautiful dog. She definitely did have a gorgeous smile. Thanks so much for sharing that for the WOOF hop! I totally see why you love that smile – it is beautiful! What a good exercise that was. I’m thinking of having that picture tattooed on my arm, with more tulips. Shh. Don’t tell my mom. I love this post for so many reasons! And I keep trying to get things settled so I can join this blog hop. I love so many things about Morgan, but right now not being able to trust her with our other dogs is pretty tough. And I question all the time whether we are the right family for her. Based on your devotion to all your pups, I find it hard to imagine a better family for Morgan. Is she able to be around the other dogs at all? Isis and Leo had to be completely separated… as in they couldn’t even be within sight of each other for more than about a minute at a time, and on opposite sides of the room. It was very difficult. I believe that Leo’s leash-reactivity is a result of spending his formative months being paraded on a leash past Isis while she barked at him. But in the end… I don’t regret getting Leo, and I don’t regret a single second we had with Isis. I just wish we’d handled things differently. Great post! Love her name and that beautiful photo. Isis sounds like a wonderful dog. I’m glad she got to live with you; being reactive is usually cause for a pet to be rehomed or surrendered to the local shelter–as if losing their family or being cooped up in a jail cell would help. I love the trainer’s questionnaire, too–great way to keep people focused on the positive.